Riding an elephant is an iconic goal for many tourists in Asia. Unfortunately, what goes on behind the scenes isn't nearly as appealing. A tourist in Thailand recently recorded a young elephant going through the first stage of the "training crush" - the harsh training process that prepares elephants for work in the entertainment or labor industries, and is so named because it's literally designed to crush a young elephant's spirit. 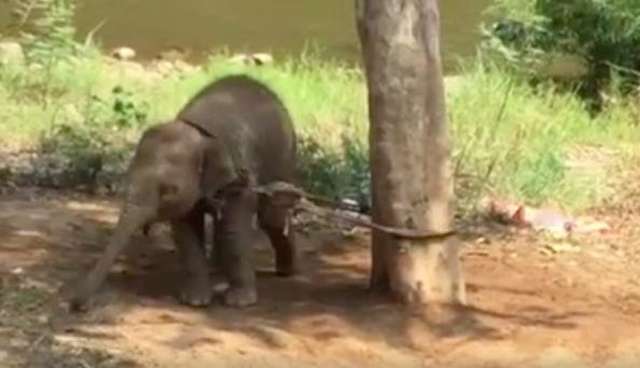 In the video, a months-old elephant calf is seen tied to a tree by a short rope, circling the trunk and straining to get away. The calf had reportedly been heard crying earlier that week when she was taken away from her mother, according to Wildlife At Risk International (WAR). "The baby will be tied like this for one week," WAR wrote, noting that the calf will have only bananas and water to eat, though Asian elephant calves should be drinking milk until they're 2 to 4 years old. Though Asian elephants will often spend their entire lives with their mothers, this little calf has been ripped away from her family as an infant - and things will only get worse. The lengthy process of the training crush can also include caging the young elephants so they can't move, forced sleep deprivation, starvation and beatings or other physical abuse. "The second step involves being cut and wounded ... inflicting pain to break the tender and fragile spirit of this elephant child and so many with her still," WAR explained. While few people know about the pain elephants go through before they're ready to be ridden and do tricks for tourists, this process is unfortunately quite common. Virtually all elephants used in entertainment or labor are "broken" before they'll allow humans to work with them (even in the United States, circus elephants undergo a slightly less painful but equally visceral "training"). "Tourists may think activities like riding an elephant do no harm," Dr. Jan Schmidt-Burbach, senior wildlife and veterinary adviser at World Animal Protection, told The Dodo in May 2015. "But the brutal truth is that breaking these animals' spirits to the point that they allow humans to interact with them involves cruelty at every turn." Sadly, it's likely too late for this little calf to escape the training cycle - the video was reportedly taken back in June. But if you'd like to help her and the thousands of other elephants still in captivity, the best thing you can do is avoid all attractions that include trained elephants. You can also support groups like Elephant Nature Park - by making a donation or by visiting - that rescue elephants from the tourism and labor industries and help them find their spirits again.